In November Mathews introduced their flagship bow for 2016, The Halon. My first reaction was positive. I like things that are built rugged and the Halon is as rugged and sturdy as I’ve ever seen in a bow. The second thing I noticed was that the dual cams were a departure from the No Cam introduced in 2015. I assumed this was speed related and that turned out to be correct. Typically, speed comes with a price. Usually that price is forgiveness and draw cycle. So when I saw the new, more aggressive Crosscentric cam design employed by the Halon I assumed this bow would have a harsher draw cycle and less forgiving shot. My shooting results did not confirm those assumptions. But let’s talk about the bow first. 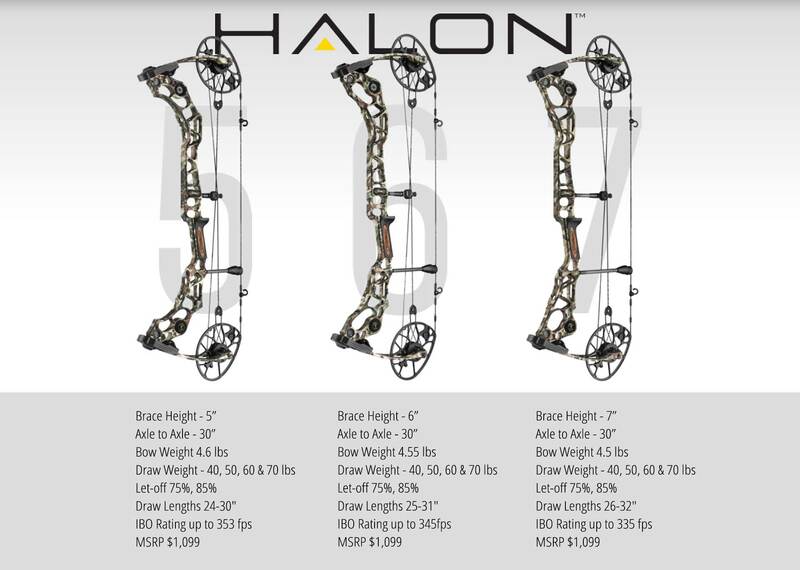 Halon 5 This bow has a very short 5" brace height and is the fastest, with a rated IBO of 353 fps. Halon 6 This bow has a 6” brace height with a rated IBO of 345 fps. Halon 7 Uses a 7” brace height and is the most forgiving. IBO is 335 fps. The riser has changed a lot. Mathews had designed a new, dual bridged riser that looks like it could support the George Washington Bridge. They also beefed up the limbs. All of this infrastructure supports the powerful new Crosscentric cam design and provides a rock solid platform that was noticed instantly on my first shot. As I mentioned earlier, I expected a harsher draw cycle than I experienced. It was very smooth. I would still give a slight (draw cycle) edge to the 2015 No Cam, but when you factor in the dramatic speed increase the tradeoff favors the Halon. In fact, if you never shot the No Cam you’ll think this was the smoothest drawing bow ever designed. I also loved the back wall on this bow. It’s like hitting cement. Shock is non-existent, supremely dead in the hand and extremely quiet - and that is with the stock bow, no aftermarket dampeners. Certainly, the heavier infrastructure contributes positively to the shock and noise improvements I experienced with the Halon. Whenever I post a review or kill shot, the 'form' critics go wild. Someone once posted that my grip looked like I was trying to kill a chicken (which is pretty damn funny). I make no apologies for my bad form since I am deadly at my self-imposed hunting ranges. 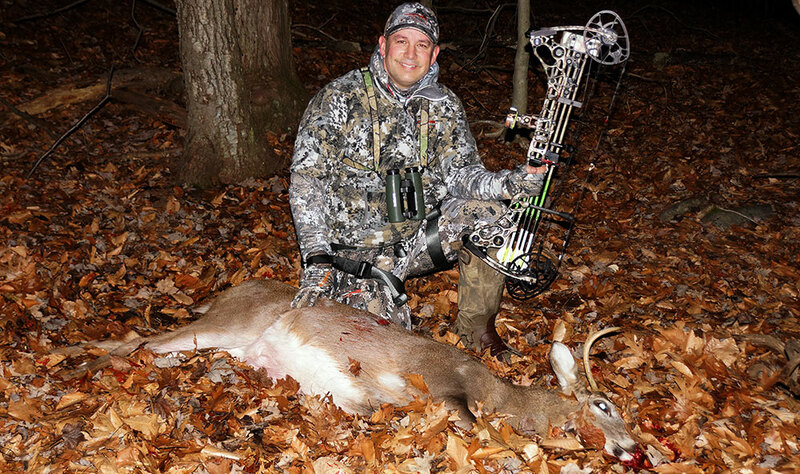 Thank goodness companies like Mathews design bows that are forgiving - and the Halon certainly fits that bill. I shot it great. Especially so for a bow with a low brace height and IBO speeds in the mid 300’s. So while this bow had scary specs for someone like me, it did not affect my accuracy one bit. I was 10-ringing everything, including a tasty buck back home during the December late season. I found the Halon to be a forgiving bow with great speed and performance - all bundled into one sturdy, good looking package. The Halon seems like Mathews blended the best features from the smooth and forgiving NO Cam with the high performance characteristics found on their Monster line. I honestly wasn't expecting that. When I saw the Crosscentric cam design, the brace height, the 30-inch axle to axle length, and the IBO speeds I assumed it would not be forgiving. But that was not the case at all. I shot the Halon extremely well and it was a nice bonus to have all that extra speed. The Halon is definitely a bow for any hunter’s 2016 short list!